Specifically designed for use with the Holley 351w Hi-Ram intake manifold, this compact unit shares all of the same great features of our other Holley EFI Dual Sync distributors. The design includes dual Hall Effect sensors for the crankshaft and camshaft signals. It can be used as just a crank speed input, as well as providing a cam sync signal for sequential fueling operation. 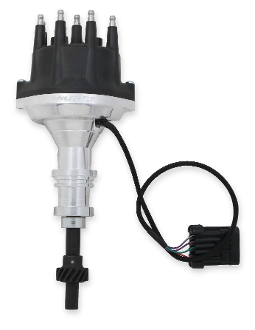 It is also perfect providing the needed crank and cam signals for Coil-On-Plug applications. The precision-machined shutter wheel design ensures accurate timing, even at very high engine speeds. Holley EFI Dual Sync Distributors are compatible with other EFI systems that support Hall Effect crank and cam sensors.